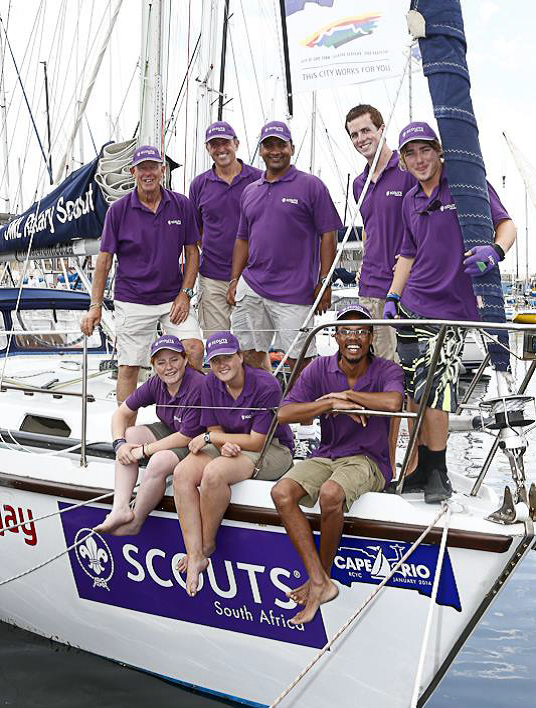 Eight South African Scouts competed in the Cape to Rio 2014 yacht race on board of the official Scout yacht, JML Rotary Scout. Despite the heavy storms and later lack of wind the crew made it all the way to Rio and back! With determination, skill and positive moral this young adventurous crew overcame the challenges the ocean and weather brought their way! While in Rio they met up with our Brazilian brother and sister Scouts and exchanged stories while going out for a ‘sail’. Experienced yachtsman, Peter Bosch was the skipper and the crew was made up of young Scouts who came through the National Sea Scout program from various parts of South Africa. 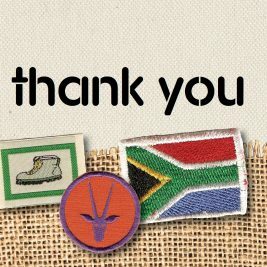 Well done to Peter Bosch (Skipper), Grant Chapman (Navigator), Virgil van der Horst (2 Oceans District), Chris Meier (2nd Plumstead Sea Scouts), Marcus Farnham (1st Mossel Bay Sea Scouts), Lorraine Le Sueur (1st Benoni Sea Scouts), Cathleen Hughes (1st Fish Hoek Sea Scouts), Ashwyn Davis (1st Bergvliet Sea Scouts). 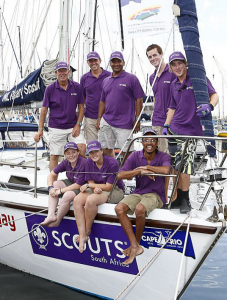 A very big thank you to the sponsors who made it possible for SCOUTS South Africa to participate in the Cape to Rio Race with our JML Rotary Scout yacht. Thank you to the Jewish Maritime League and Eikos for your ongoing support and to Sat-4-Rent, Globecomm, Cape Maritime Electronics, Southern Ropes and Pick n Pay.